The long-lasting orchids combined with the buds of the fragrant woven ginger make this lei a fashionable choice. 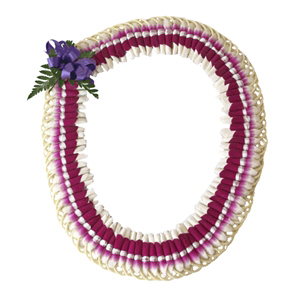 The Micronesian-style ginger lei is woven flat with the stems of the ginger used as part of the lei’s embellishment. The deep purple orchid petals accent the white ginger buds to create a dreamy, sought-after lei. An excellent choice for your sweetheart! Looks striking on both men and woman!